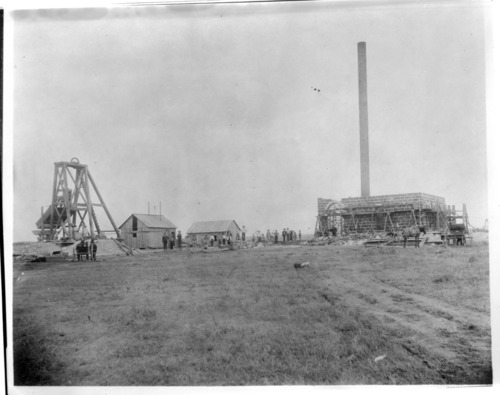 This is a photograph of a salt mine under construction in Kanopolis, Kansas. The mine, which was one of the earliest in Kansas, opened in 1890 and closed in 1924. Patron provided information suggests this is the Royal Salt Mine at Kanopolis, and that the sandstone blocks used to build the hoist house and boiler house came from the hospital at Old Fort Harker in Kanopolis.